Do you have a minute to spare to learn some English? Sam's very happy, really excited and absolutely thrilled to explain all about very, really and absolutely! Give us 60 seconds and we'll give you the English! Welcome to BBC Learning English. I'm Sam and today I'm happy. In fact, I'm very happy. I'm really happy. Thrilled! I'm really thrilled! I'm absolutely thrilled! My happiness keeps getting bigger and bigger. I started with the word 'happy'. 'Happy' is a gradable adjective, so I can be happy – here. Quite happy – here. Very or really happy – here. What's another way to say very or really happy? Thrilled! Thrilled is not a gradable adjective. It's an extreme adjective. It's already up here. So, can we make it stronger? Yes! You can use really. I'm really thrilled. Or absolutely. I'm absolutely thrilled. But you can't use very. Very, really, and absolutely are adverbs. They modify adjectives and other adverbs. They are usually placed before the adjective or adverb that they are modifying. Gradable adjectives are describing words that can be modified to make their meaning more or less intense. Words such as: a little, quite, really, and very are able to modify this group of adjectives. Examples of gradable adjectives are: happy, good, hot, funny. The weather's been really hot lately. The film wasn't good. It was only a little funny. Non-gradable adjectives (also known as extreme or strong adjectives) cannot be used with words such as very. This is because they already contain the idea of very. The word thrilled means very happy. Because of this, when we wish to make a non-gradable adjective stronger, we need to use words such as 'really', 'utterly' or 'absolutely'. Finally, many gradable adjectives have non-gradable pairs: very happy - thrilled, very good - wonderful, very hot - boiling, very funny - hilarious. The weather's been boiling lately. The film was absolutely wonderful. The dialogue was utterly hilarious! 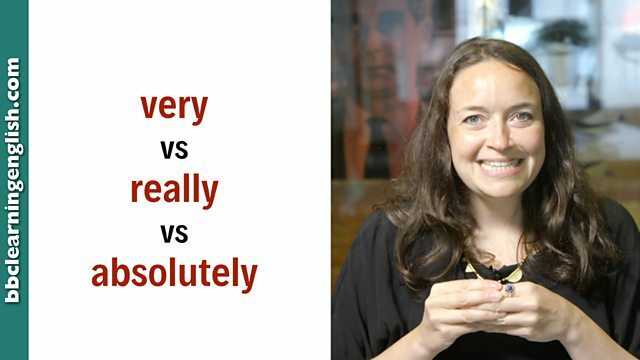 Where do adverbs like 'very', 'really' and 'absolutely' go in relation to the adjective? Which pairs of gradable and non-gradable adjectives were mentioned on the page? Look above if you can't remember. Which of these is not a correct gradable to non-gradable adjective pair? Is thrilled a non-gradable adjective? Which word do we not use? Which word CANNOT complete this sentence: The day he asked me to marry him I was ______ thrilled.